This past Friday I had the opportunity to sit in on a media conference call with Lisa Kudrow, one of the executive producers of Who Do You Think You Are? Through the course of the thirty-five minute conference call, various people from the genealogy and entertainment media asked Lisa about the upcoming season. Although I requested a copy of the transcript, I'm still waiting. What I want to share with you from the conference call is based on my notes, and may not be word for word questions and responses. Q: Will there be an expansion of the season, with more episodes? A: Lisa replied more is better. Already the show has expanded from 7 episodes in season 1 to 12 episodes this season. 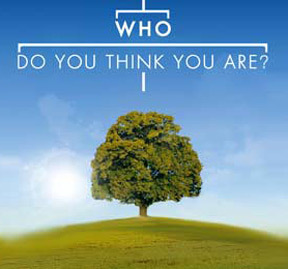 Q: Will WDYTYA have a US genealogy conference, or presence at a conference? A: Although they have been invited, Lisa said they are not sure if they want to participate just yet. Q: Thomas MacEntee of Geneabloggers asked a question with regard to the use of DNA, and was there any focus on that on the show. A: Although there was no direct focus about DNA testing on the show, Blair Underwood has taken a DNA test. Q: Why is genealogy so important to the immigrant experience? A: There has been little or no information passed down from the immigrants said Lisa. This was due to the hardships they suffered in the Old Country. They wanted to forget about their old lives, and focus on their new lives. Lisa said the celebrities do get caught up in wanting to find out more information about their families for their mom or dad. Q: I asked Lisa "How much of the research do the celebrities do themselves?" A: Lisa responded that it depends on the celebrity's own interest, and what information can be found. One main researcher is assigned to each celebrity. These researchers are usually history majors who reach out to other local experts for assistance in locating information and records. The more engaged the celebrity is, the better the episode. Q: How long is the research process? A: Lisa said it really depends on the ancestry of the celebrities. Blair Underwood’s went fast. However, researchers for both Rob Lowe and Marisa Tomei have been working since Season 1. Q: Dianne Haddad of Family Tree magazine wanted to know what has been the biggest improvement on the show? A: Getting rid of the video montage from Season 1, answered Lisa. With only 40 minutes per episode, the montage wasted valuable time. Also, according to Lisa, this season has more history of events to give better context of the times and circumstances with which the ancestors were living. When WDYTYA first started in the US, celebrities were a bit apprehenisve about being on the show. They were worried that the show just wanted to dig up dirt about them. Now that they know what WDYTYA is about, Lisa says celebrities such as Blair Underwood, are asking her to be on the show. There is now a waiting list. Q: Are there any big reveals this season? A: Some of the stars don't know what's coming. Blair and Reba have big reveals, shared Lisa. Actually they all reveal something, they're all good, but those two are the biggest. Martin Sheen, Marisa Tomei, Blair Underwood, Reba McEntire, Rob Lowe, Helen Hunt, Rita Wilson, Edie Falco, Rashida Jones, Jerome Bettis, Jason Sudeikis and Paula Deen. Episode One, Season 3 airs this Friday, February 3rd on NBC and City TV.